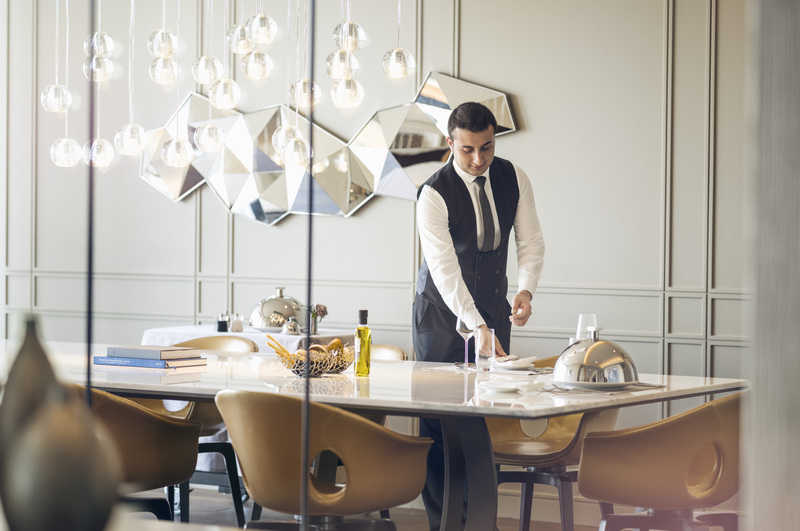 Opened in early 2017, the sleek Fairmont Quasar Istanbul occupies prime real estate in the city’s buzzing Mecidiyeköy district, where 21st-century malls and offices reside alongside lively bazaars and storied side streets. 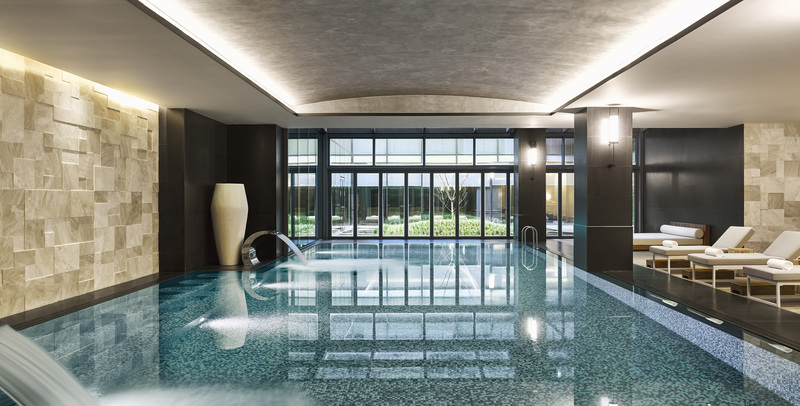 Designed by US-based firm Wilson Associates, Turkey’s first Fairmont hotel draws its inspiration from the area’s heritage and natural surroundings. Standing behind a Robert Mallet-Stevens-designed Art Deco liquor factory, the glitzy tower melds modern style and comfort with industrial touches and playful references to the Bosphorus waterway. The hotel’s striking lobby is sure to grab your attention with its sweeping white marble and wood floors, enormous locally made lanterns and a chandelier uniquely crafted from chains. As you check in, you’ll notice the innovative choice of materials in the reception desks, an eye-catching mix of metal, wood and stone. Throughout the building, keep a lookout for the hotel’s art collection of more than 1,000 pieces produced by young, local artists. The eclectic range encompasses everything from ceramics and drawings to photography and unusual installations. 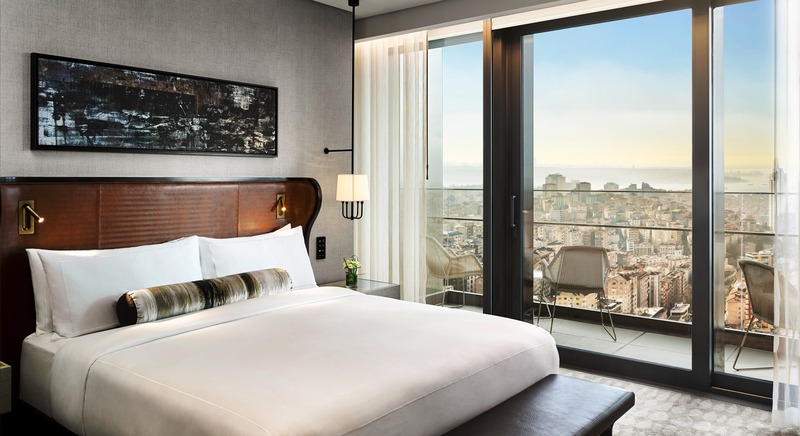 Contemporary elegance meets industrial chic in the hotel’s 209 spacious guest rooms and suites, all with extensive natural light and Instagram-worthy views of the Bosphorus or city skyline thanks to floor-to-ceiling windows. Blue, leather-tufted headboards are a subtle reference to the Bosphorus, and the mini-bars draw inspiration from vintage travel trunks, complete with leather and studs. Once settled in, you can sink your toes into luxuriously soft custom carpets, designed by esteemed Turkish manufacturers Ottoman Hali and Stepevi. Need to freshen up? Step into your bathroom, a tranquil spot created to give you the feeling of a soothing Turkish hammam. All rooms come with a rain shower, and, while you have the option to choose a regular bathtub, you can also opt for a Turkish bath with authentic tap, basin and heated pedestal for the ultimate in invigoration. If you’re planning a longer stay, the hotel’s 25 suites have smart living rooms and large private balconies where you can sip coffee or cocktails while enjoying sweeping city and water vistas. All guest rooms and suites feature state-of-the-art technology, including iPads for accessing hotel information, Bose speakers and fibre-optic internet, making staying connected a breeze. 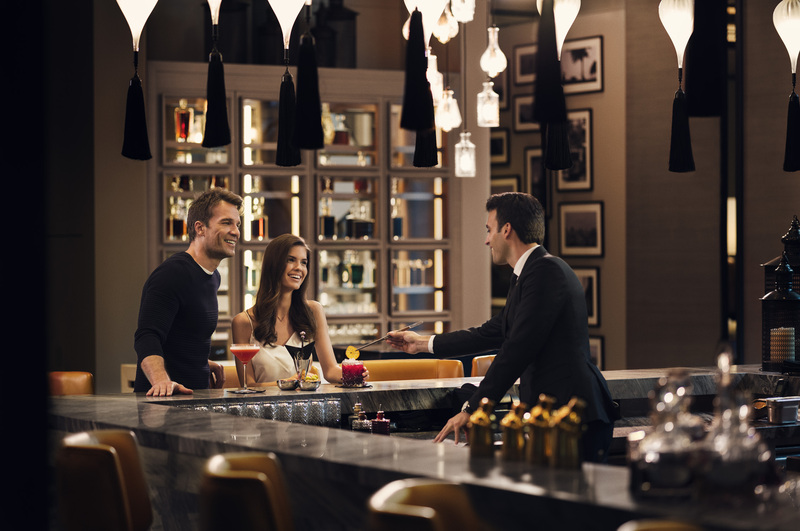 Whether you’re looking for afternoon tea, dinner with a business partner or a quick late-night bite, the hotel’s dining spaces offer sophisticated, relaxing spots for eating and drinking. If you’re taking tea in Demlique, make sure you also take in the surroundings, from the wooden floor with its classic herringbone pattern to the Art Deco-style wall details and dramatic geometric ceiling installation. Shelves adorned with Turkish artifacts and books give you a sense of place as you enjoy a traditional afternoon tea. For local flavour, opt for the Istanbul menu, with treats such as goat cheese and eggplant sandwiches, baklava with clotted cream and pistachio crunchy rolls. All-day eatery Stations is lively any day of the week, but on Sundays, fashionable locals make a beeline for its popular brunch. The restaurant’s design reflects elements of the old liquor factory, mixing traditional and modern with a dark metal framework, industrial pendant lighting and antique Turkish rugs alongside gleaming marble counters and a backlit, glass-panelled ceiling. Live cooking stations offer a choice of delicious global cuisines such as baked Norwegian salmon, Thai green curry and Beirut falafels. Specialty Turkish restaurant Aila celebrates Istanbul’s reputation as a city that’s vibrant both day and night. Its distinct spaces include the Spice Library, decorated with colourful Turkish tiles and filled with more than 100 spices in wooden drawers. One dining room features a bright mix of white marble tiles and wood, while another has a darker theme, punctuated by a gold mosaic, a nod to the domed Hagia Sophia basilica. At Aila, you can tuck into mezze such as lentil balls, grilled artichoke and octopus or order shish kebabs and lamb chops from the central ocakbaşı grill. After a busy day of meetings or sightseeing, unwinding in the Willow Stream Spa offers a serene retreat from the city’s noisy activity. Patterned mosaics add a Turkish touch to the ultra-modern spa, which has nine treatment rooms, saunas, steam rooms and an indoor and seasonal outdoor pool. Signature treatments include a Turkish coffee and coconut sensory oasis, involving a coffee grain exfoliation and full body massage with coconut oil, and a Turkish hammam experience, where you can indulge in a full body scrub and relaxing scalp massage. The elegant hammam itself is a calm, white space with polished, marble walls and benches. Head outdoors, and you’ll find a fantastical zone dreamed up by Dutch designer Marcel Wanders, where gigantic golden globes grow on trees and red floral statues keep watch over a cozy lounge garden. All you need to do is relax on a white sun lounger by the infinity pool, order brunch, bites or cocktails and gaze at the dynamic Turkish city below. Planning your Istanbul visit? Visit www.fairmont.com/istanbul today to book your stay.